Turn off all power before working on your pump! 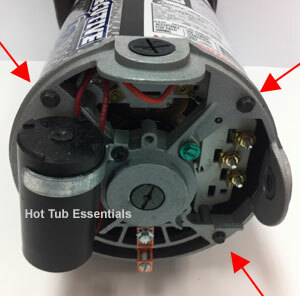 The discharge on a spa pump can be turned 90 degrees in either direction. This is very easy to do, once you realize the bolts are on the back of the motor. The long bolts are on the end the electrical connects to. 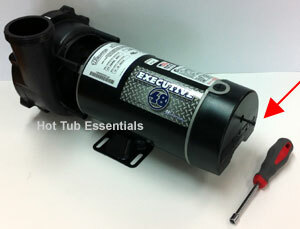 On most 48 frame pumps, you first have to remove the plastic or metal cover on the back of the motor. It is held on with one 1/4" bolt in the middle of the cover. Once you take the electrical cover off a 48 frame pump, you will see the four 1/4" bolts on the outer edge of the motor. 56 frame motors usually have four 5/16" bolts, and there is usually no cover hiding the bolts. Simply loosen all 4 bolts and pull them out an inch or so, to make sure they are loose. Then turn the wet end the direction you require, and tighten up the bolts. It is best to use a nut driver (like in the top picture) to tighten the bolts, and be careful not to over tighten the bolts. Note: On some pumps with large wet ends, you may find it easier to place the motor on a block of wood, so the wet end will turn freely. How to tell if you have a 48 frame or 56 frame pump?